ROOF FORM On the whole, dollhouses until the 1950s were constructed w ith roofs that have the main ridge running parallel to the front wall. That wall, along with the back wall, is long in contrast to the shorter end walls – basically a box topped by a gable roof (on right, 1940s, Canadian). The scheme may be made more complex with dormers, bay windows and verandahs. The exceptions, showing a gable form over the front wall, may be related to the Classical Revival style of the 19th century. 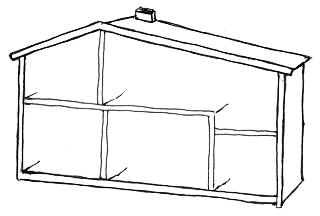 During the 1950s, reflecting trends in real houses, alternatives were offered such as flat-roofs or roofs with the ridge pole running at right angles to the front wall (drawing, left). These dollhouses were marketed as being in the Modern Style by a number of manufacturers in North America, Great Britain and Europe. One company has successfully clung for a half century to the type with the ridge at right angles to the front – Lund by of Sweden (the name now owned by Micki Leksaker, Gemla, Sweden). In fact, since 1984, the company logo shows just such a shape, distinctive in part because the one portion of the roof slope is longer than the other creating an asymmetrical form. Given the enduring popularity of this form, which co-existed with other types of dollhouses by the same firm, it is worthwhile musing on why this roof type was selected. Simply known as the Lundby dollhouse in the late 1960s, it is now known as the Gothenburg or Göteborg, a term given in 1990 to distinguish them from other Lundby houses such as the Stockholm (introduced in 1976, given the name “Stockholm” in 1990, below right, and reinvented with a new form in 2005), the Manor (1981), Country House or Tudor (1987), Play and Learn House (1987) and Norrland (1990, below left). 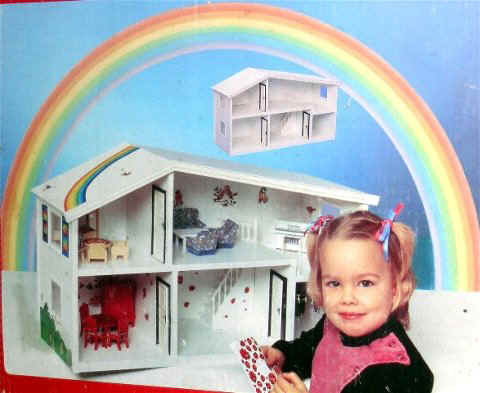 Through modest changes and additions, the Gothenburg has survived the coming and going of other Lundby house types, including versions of itself, such as the Rainbow House, made only in 1985. It was available with a white interior and pink trim or all white with optional colourful decals (below left & right). DOCUMENTED SOURCES Unfortunately, there is little printed visual evidence that has survived from the 1950s of Lundby products. 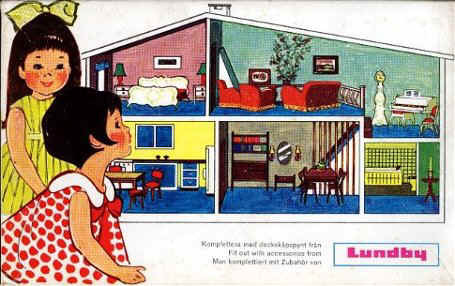 The earliest web-published catalogue of AB Lundby Leksaksfabrik, likely from the late 1950s (previously thought to be 1947), shows a house with a traditional gable roof over two-storey box-l ike form. By the next surviving catalogue in 1966, the ancestor of the Gothenburg House (as portrayed as recently as the 2005 catalogue, right) is easily recognized. 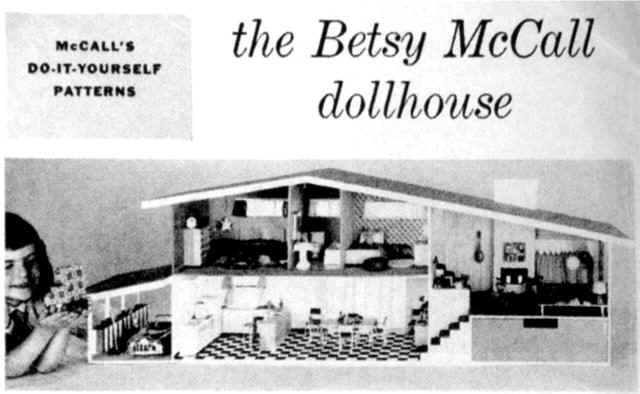 While a number of actual dollhouses exist that may be from the 1950s or early ‘60s, it is difficult to date them precisely without comparing them to dated printed material. One could acquire four wooden legs to screw into these certain of early dollhouses to raise the house to a child's eye-level. 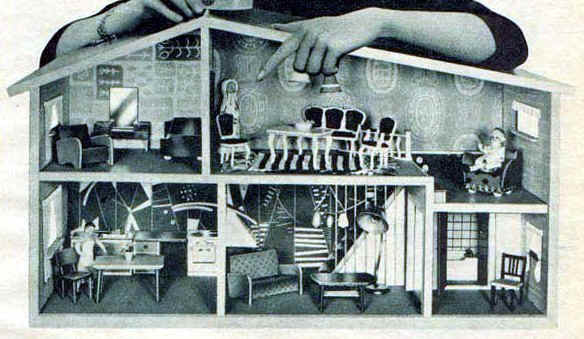 Recently a number of “Modernes schwedisches Puppenhaus…” (Modern Swedish dollhouse) illustrations from 1960 to 1964 have surfaced. For 1960 there are 2 views of the same house, although with different furnishings and variations in the wallpaper: the first illustration below is from an advertisement of 1960 for Fenom (kindly sent by a Lundby collector) and the second from Franz Carl Weber's catalogue which, fortunately shows the chimney. The dining-room wallpaper is spectacularly modern with a bold abstract image. The Weber ad emphasizes "Neuhuit!" -- does this mean a new addition to the products sold by Weber or is the form of the house new? The answer willl materialize if dated images from the 1950s are discovered. 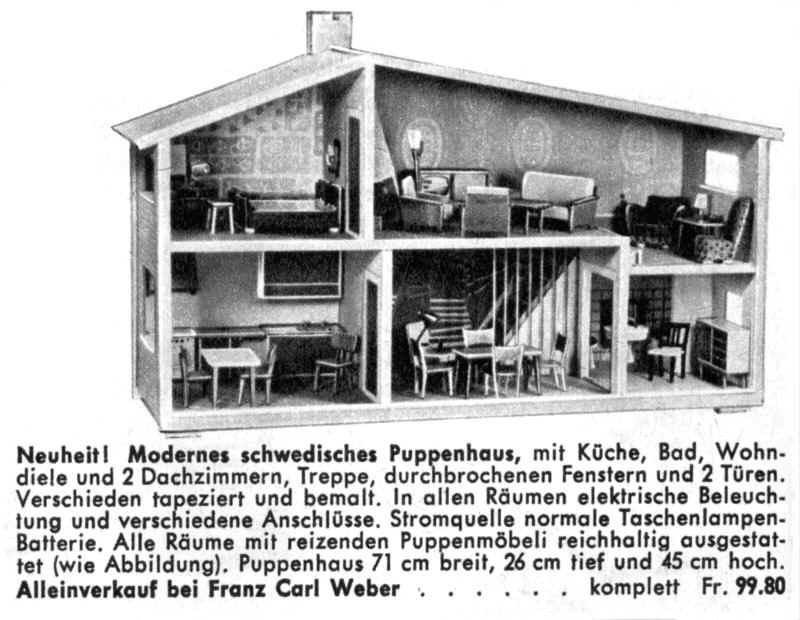 Weber’s caption, which begins, “Modernes schwedisches Puppenhaus…” (Modern Swedish dollhouse). The caption goes on to note that it was completely papered and painted, held many charming pieces of furniture and was safely wired for electricity. 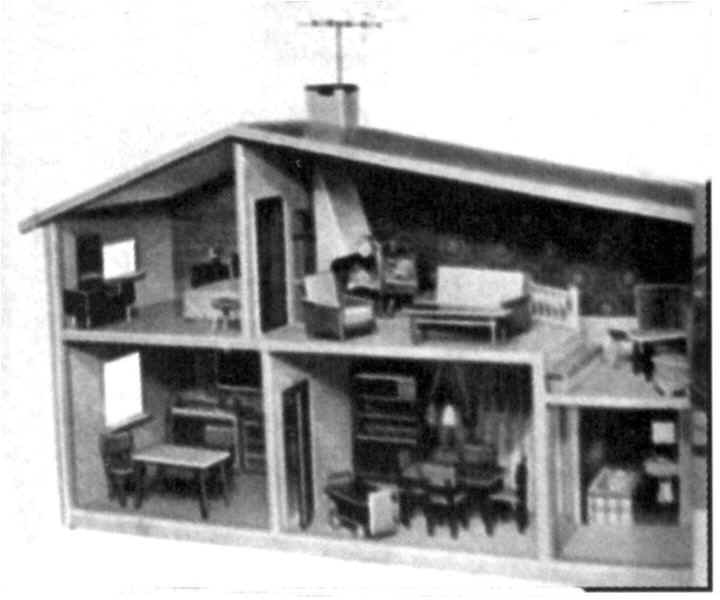 The dollhouse was 71 cm wide, 26 cm deep and 45 cm high. These measurements are about the same as a Gothenburg House from the mid 1970s, except it is a little lower because, by then, it no longer incorporated the television antenna that topped the 1961 house behind the chimney. 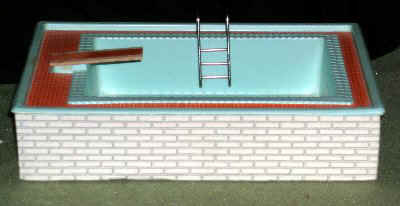 It is worth noting that the chimney cap has a lower open part in the top centre, characteristic of Lundby houses in the 1960s and first half of the 1970s. Aside from the confirmation, via the antenna, that a television was part of the 1961 furnishings, other pieces appear to be in a simple “modern” style. The independent fireplace with its white slanted upper part is familiar because it was carried in the Lundby line until 1975 (catalogue number 5773). 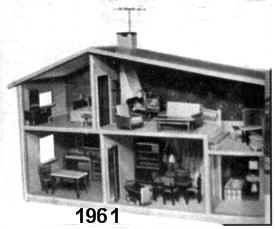 The interior plan of 1961 is familiar including the balustrade protecting the stair-well in the large upstairs room (furnished as a sitting room with fireplace) with its open modern form that includes a lower portion (sort of an extensive stair landing) accessed by a single long step. 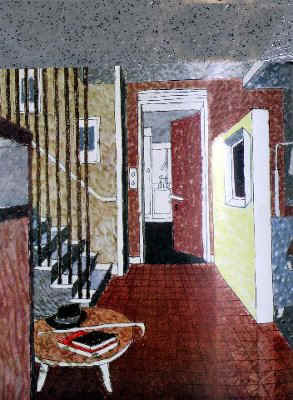 The staircase descending into the centre main-floor room (furnished as a dining room) is distinguished by floor-to-ceiling wood rectangular spindles, seen in real houses of this period (for example, as illustrated in the Architectural Review of November 1950, A), and surviving in Lundby houses (B: example from the 1960s; C: rendering from a box pre-1967) to at least 1972 . By 1974 (and still in use today), they were replaced by less “dated” white, turned uprights under a hand-railing. 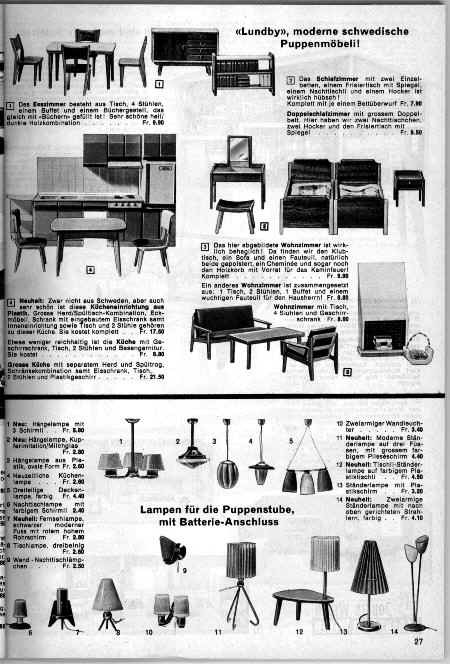 1963-64 Weber catalogue showing "Lundby modern Swedish dollhouse furniture"; some of the lighting fixtures and lamps are shown in the house illustrated above -- but any would be suitable to use in a Lundby house of this era. OPTIONAL ADDITIONS AFTER 1972 In 1961, the house consisted of only two storeys, and was not expanded by the optional basement until 1972, when one could also acquire a lawn and swimming pool. About this time, it was optimistically described as a "modern villa", but – perhaps as an acknowledgement of its increasingly dated form (novel in the 1950s) – there was an ongoing attempt to create variety with optional additions (left, c1975-78). 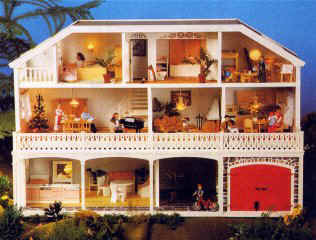 Despite spicing up the design by adding a storey with a “built-in” garage designed for a special Lundby car in 1974 and, a year later, a balcony and garden, the house was described realistically in 1981 as Lundby’s “traditional dollhouse.” Even changing in 1979 from the brown trim to white was not enough to modernize it. 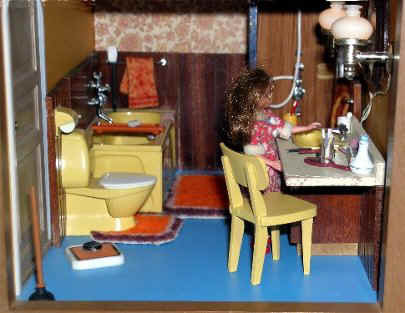 By 1999, enough time had passed to wax sentimental about its history and the Lundby Home Journal compared the 1967 version with one from 1975. As part of the promotional material, there was a consistent reminder given to customers that the furnishings were continuously updated and that the wiring system was an advantage. 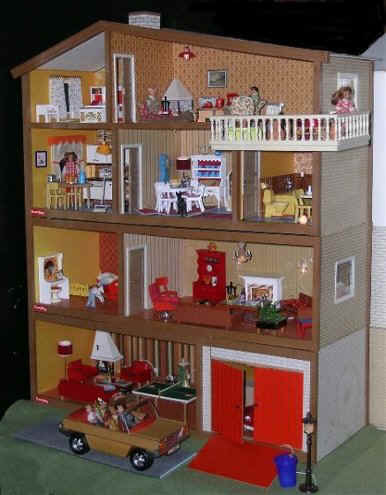 Although the company today promotes the idea that Lundby was the first company in the world to manufacture dollhouses wired for electricity, other companies, such as the Vista Toy Company of New York or Schoenhut of Philadelphia, had electric lights since at least the mid 1930s. 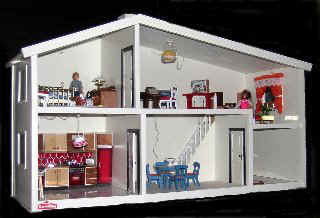 It is likely true that Lundby is one of the oldest companies still making mass-produced dollhouses famous for their built-in wiring. Why then did the Gothenburg House survive the vicissitudes of changing taste? I think it was a clever blend of the traditional and modern. How could it become “dated” if it was intrinsically traditional? SWEDISH MODERN IN ARCHITECTURE AND DESIGN Since 1930, Swedish architecture has been admired for its Modern style, a movement slowed down and impeded by the Second World War. 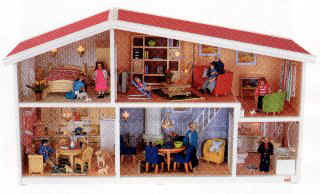 A love of “Scandinavian Design” (a catch phrase in the 1967 Lundby catalogue) in the decorative arts swept through North America in the late 1950s and 1960s with products imported from Norway, Finland, Denmark and Sweden. From 1953 to 1957, for example, an exhibition, “Design in Scandinavia” travelled throughout North America with 700 examples of decorative arts from Denmark, Finland, Norway and Sweden. In architecture, it is difficult to separate national styles in the late 1940s and 1950s, because the improvements in communications through illustrated magazines and books, as well as the immigration to the United States of avant-garde European architects (such as Walter Gropius and Mies van der Rohe), meant the quick spread of ideas resulting in the “International Style.” Favouring functionalism, it rejected historical decorations and forms and celebrated new building materials such as steel, reinforced concrete and plate glass. The lack of fussy ornament and simple lines of the Gothenburg House align it with the modern movement. 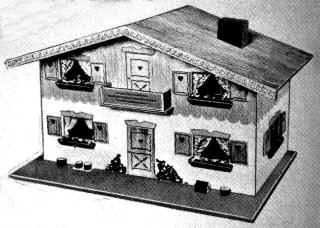 American dollhouse manufacturers were producing houses with the asymmetrical roofline in the 1950s. By 1956, you could even build your own house from patterns provided by a McCall’s iron-on pattern to create a split-level under an asymmetrical roof with an attached carport (left). 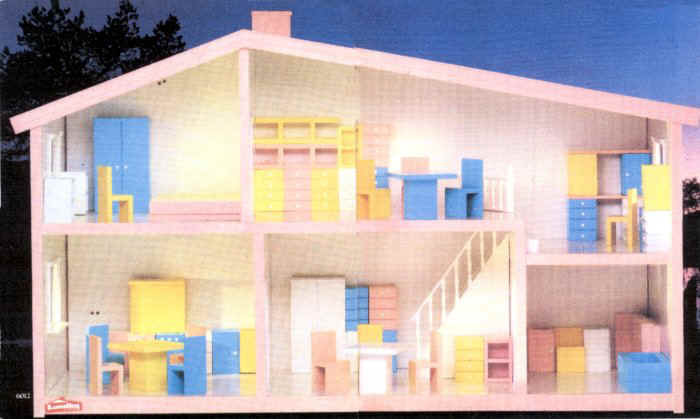 Or a Terry Lynn dollhouse in “California Modern” of 1953. 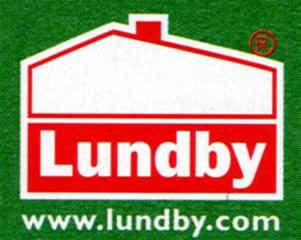 It would be interesting to know if Lundby took the Gothenburg form from other manufacturers or the reverse is true. Until more documentation in the form of written descriptions or illustrations from the early 1950s appears, it is impossible to know. 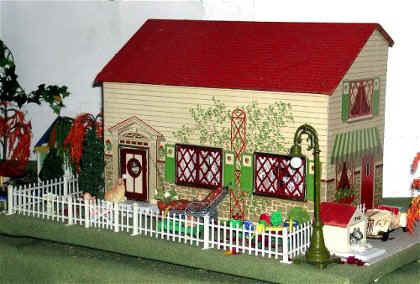 Generally speaking, dollhouse manufacturers reflect what is popular in the real world. Children want to manipulate houses, interiors and furnishings that echo those controlled by their parents. 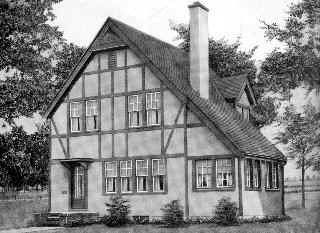 The basic form of the Gothenburg House was part of the modern style appearing in North American and European suburbs in the 1950s. About 1952, in a development at Don Mills (now part of Toronto, Ontario, Canada), houses were being designed by architects who were influenced by Swedish Modern and indirectly by the ideas of the German Bauhaus (an avant-garde school of art and design that flourished from 1919 to 1933) via the work of Walter Gropius. A photograph in the Journal of the Royal Architectural Institute of Canada (RAIC), January 1954 shows new Don Mills houses with the Lundby Gothenburg roof form (below). 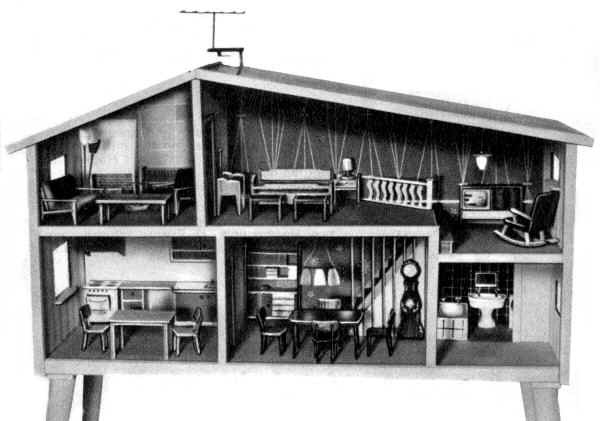 Other examples include houses in the Philadelphia-Wilmington area, as illustrated in the Practical Builder in August 1956 (below left). In other words, it was mainstream by the mid 1950s. In 1958, a number of houses (below right) of this type was built in Utby, Gothenburg, to the designs of Yngve Lundquist under the impetus of a periodical Hem I Sverige (Homes in Sweden). THE CHALET Despite interpreting the Gothenburg House as “modern,” there may also be an allegiance to a traditional European house type – the chalet, which is particularly well represented by the Swiss chalet. This was well known as a type even in 19th -century United States. A.J. 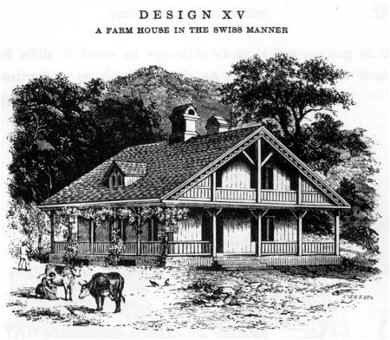 Downing, a popular American writer on architecture, illustrates an example (below left) in his book, The Architecture of Country Houses (1850) and a design for an American farmhouse (below right) derived from it. The broad roof with a deep overhang has its gable end over the front wall. 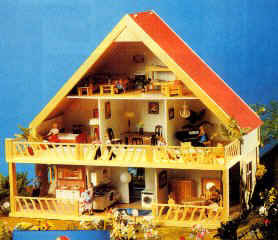 In general, the chalet has equally dimensioned roof slopes in distinction from the strong asymmetry of the Lundby roof. 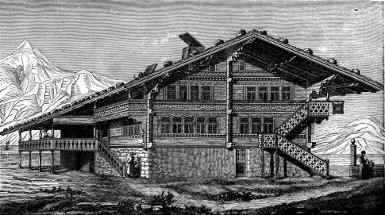 However, the chalet, as it developed during the medieval period in Europe, had additions casually attached, sometimes creating a rambling asymmetrical appearance (left). 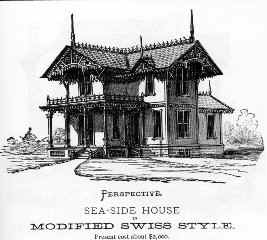 An interest in modified chalets continued, as seen in Bicknell & Comstock’s American Specimen Book of One Hundred Architectural Designs of 1880, including a “modified Swis s style,” (below right) which suggests that the late 19th–century interest in houses with pronounced front gables, featuring broad overhangs with fretwork and balconies, owes an ancestry to the Swiss chalet. Echoes of this are seen in some Bliss dollhouses of the early 20th century. 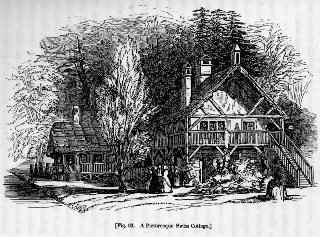 The asymmetrical roof over the front wall merged into English Tudor style in books showing houses in the late 1920s (left). 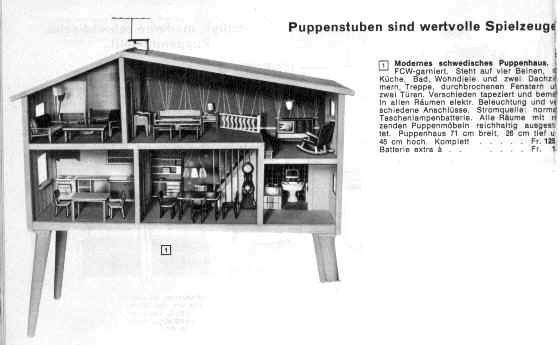 The chalet relationship to certain dollhouses of the mid 20th century is demonstrated the German Peasant dollhouse shown in the Schwarz catalogue of 1961, which has symmetrical roof slopes (right). 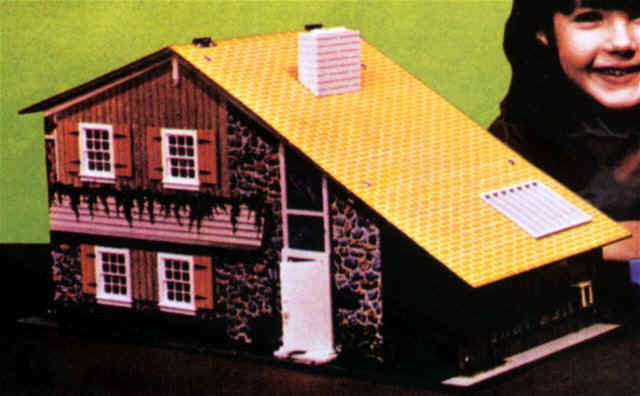 In the 1970s and ‘80s, asymmetry in the chalet dollhouse is seen an example by Brumberger with quaint hinged shutters and a traditional balcony juxtaposed with a contemporary plate-glass window and carport (below left). Regardless of the permeations of style, one can argue that there was a familiar comfort to the Gothenburg House despite its modernity. It is, of course, the interrelationship of age-old craft knowledge, continuous tradition, which is the knowledge and use of indigenous historical forms and the individual creative mind, which have brought about the refinement of Scandinavian objects for daily use….the form does not merely follow the function, the function derives its life from the form.